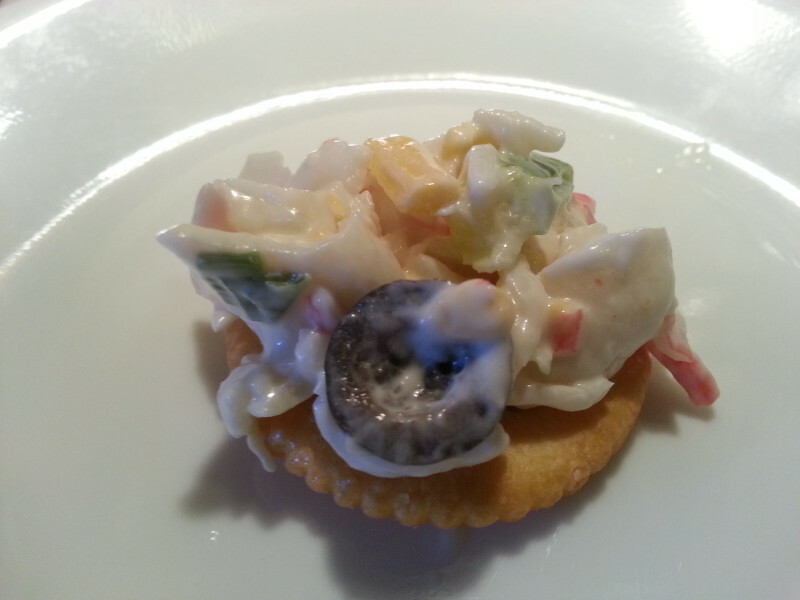 Today’s recipe is for crab or seafood salad. It’s one of those things that you may be tempted to pick up in the deli or seafood section of your local grocery store, but it’s so easy to prepare at home, you can save your money for something else. All you need is some surimi or imitation crab, green onions, celery, mayonnaise, and some Old Bay seasoning as a minimum. Actually, Baker’s Man says it’s good without the veggies. 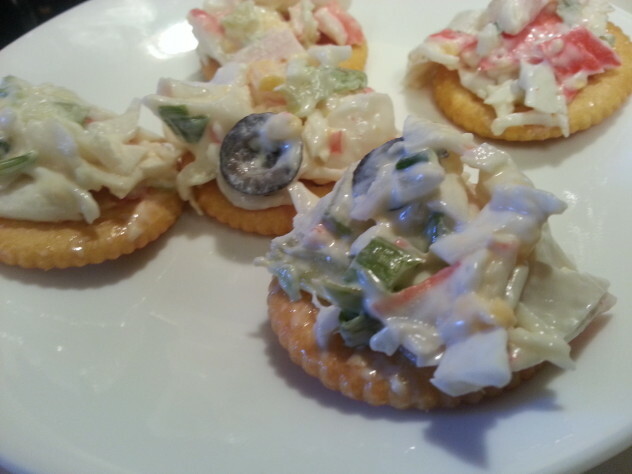 His recipe includes only Krazy Krab (surimi), mayonnaise, and old bay seasoning. He learned this recipe when he worked in a sandwich shop, and the shop sold a lot of “Seafood Salad” sandwiches. When I’m feeling like making a fancier version of seafood salad, I add extras like sliced olives and finely chopped cheese. If I don’t have green onions, some chopped yellow onion can easily be substituted. This seafood salad is great for a crowd. It’s delicious on crackers, between two slices of bread, or topping a salad. You can even eat it by the spoonful or serve it in an avocado or tomato. Whip some up for your family, then leave a comment to let us know how you liked it.As always, thanks for visiting Patty Cake’s Pantry. This salad can be changed with the addition of more or different vegetables. Salad shrimp, canned or previously frozen, can be substituted for half of the crab to create a mixed seafood salad. We tend to like ours a little dry. Feel free to add more mayonnaise to make it more moist. Cook's Note: If you can only find a 10 ounce package of surimi, it's OK to use the entire package in the salad. In a separate bowl, mix mayonnaise with Old Bay seasoning. Add mayonnaise mixture to meat and vegetables in the bowl and stir until well mixed. Adjust mayonnaise and seasoning as desired. This is best when allowed to chill, covered, in the refrigerator for a couple of hours before serving to allow the flavors to combine. Looks good. I like crab salad. Yummy snack on a cracker, too. It’s so easy to make. I don’t know why I don’t make it more often. My favorite is half crab and half shrimp stuffed in a half of an avocado. Can you say yummy?